She is a graduate of the University of Southern California and holds a BA in Print Journalism. 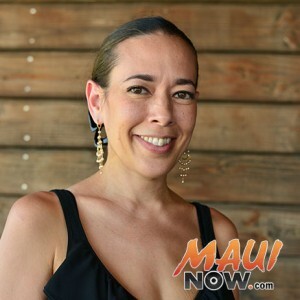 As a multi-media contributor, her writing and photographs have been published in the Honolulu Star-Advertiser and her video work has appeared on various network television stations. In her free time, Wendy loves hula, art and culture. In celebration of Earth Day, Pacific Biodiesel conducted a blessing today at the site of Maui's first state-licensed industrial hemp farm. Vandals had broken into the St. Anthony Church overnight and damaged many of the statues and religious items at the place of worship. Maui police responded to 16 burglaries, 17 vehicle thefts and 34 vehicle break-ins in Maui County over a seven day period from April 6 to 13, 2019. Lorden Cooper and Jamen Sugahara were charged and bail set at $81,000 each. Governor David Ige today sent a letter to the Senate President and House Speaker, calling on lawmakers to revive a controversial water holdover bill. The Federal Aviation Administration is investigating the precautionary landing of a small Cessna plane in Puʻunēnē earlier this month. Maui fire crews are responding to a residential structure fire at a home in the Maui Meadows subdivision. The incident was reported shortly before 11 a.m.
Maui police issued a total of 216 cell phone violations last week during an enforcement effort aimed at curbing distracted driving. Troy Diego, 30, is now in custody, according to Maui police Lieutenant Gregg Okamoto. Details are pending release.